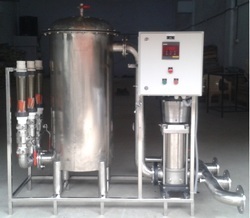 Prominent & Leading Manufacturer from Ahmedabad, we offer cip system. As a trust worthy organization of this domain, we are committed to offer our clients a superior quality assortment of CIP System. The offered system efficiently cleans all types of machineries, equipment, and devices and pipelines attached and used in the wastewater treatment plant. Offered system cleans entire treatment machineries and parts without dismantling the unit. Our professionals manufactured the system using optimum grade materials along with adhering to industry standards. Furthermore, we ensure to opt for strict quality inspection before installing the system.